하나의 테이블에서 얼마나 많은 정보가 발생할까? 테이블의 내용은 모두 정상적으로 입력되었는가? 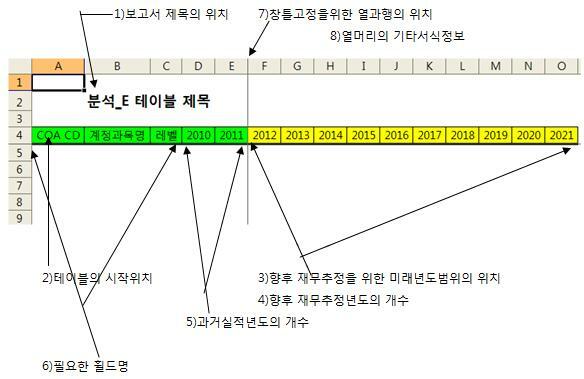 Public Const TBL_START_ADDRESS As String="A4"
Public Const TBL_FONT_NAME As String="맑은 고딕"
Pubiic Const TBL_NUM_FMT_MON As string="###,###"
Public Const TBL_NUM_FMT_PER As String="0.0%"
Public Const TBL_NUM_FMT_DAT As String="yyyy/mm/dd"
되는 것들이 많이 화일에 올리게 되니 이 코너는 참 잘 한 짓이다..
화일의 내용은 매회 조금씩 실무에 맞게 수정될 것이니..